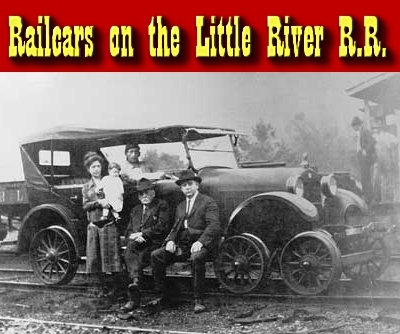 This page is a followup to our 2008 articles on the Little River Railroad (and Logging Company), which operated out of Townsend, Tennessee between 1902 and 1939. It was unique in many ways, some of which provide excellent modeling opportunities in many scales, especially Large Scale and On30. 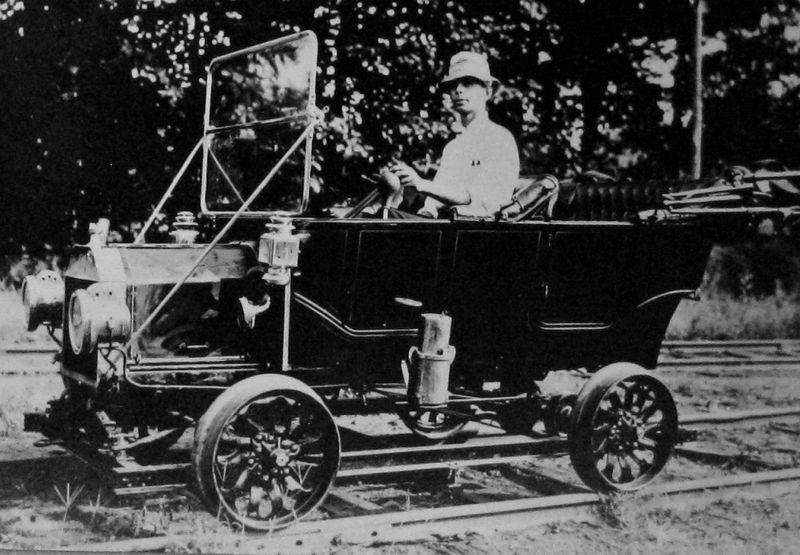 This article focuses on a part of the railroad's history that reflects that of many other railroads of that era - adapting gasoline-powered road vehicles for rail service. Most rail cars were used as inspection vehicles. Surviving photographs of the Little River Railroad's rail cars imply that "inspections" were often really "tours" or pleasure drives, chances for Townsend or his associates to get out into the fresh air and see operations first-hand. The photos in this article might remind you of one or more of the fine rail car, rail bus, or rail truck models available in gauges like Large Scale and On30. Or this article might get some of you looking at model car kits and measuring the wheelbases of various power trucks. Either way, we'd like to hear from you if you use any ideas from these articles. If you look closely, you can see that the car's frame has been supplemented by I-beams and other supports. It is possible that there is a leaf spring directly under the radiator, and it almost looks like a belt drive is going to the rear axle. Sadly, this clever adaptation eventually perished in a collision with steam locomotive #110, which was a lot more solid. The "bus-style" windows seem to raise and lower like those of contemporary passenger cars and trolleys. It looks like a chain drive is going to the rear wheel, but we can't be entirely certain where the engine is. Note the steps and lamps on the rear and the headlight on the front. 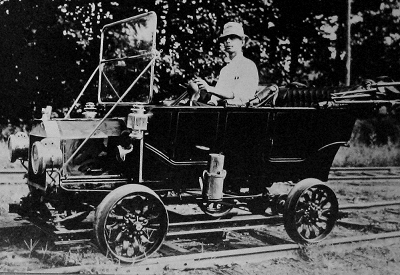 This vehicle maybe unique among standard gauge railroads, although a number of narrow gauge railroads built similar contraptions. While gasoline engines wouldn't be pulling real trains for a very long time, they could pull a handful of people over a mountain ridge cheaply and safely. 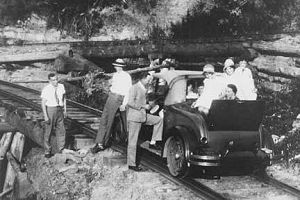 And, as the photo of the D. H. Tipton inspection car to the right shows, when you need to turn them around, most of the early railcars were light enough to be picked up by four or five strong men. Not to mention that riding them must have been a lot of fun! It doesn't take much imagination to consider putting the power truck from a diesel engine underneath a model car in the scale you need. You WOULD need to measure the wheelbase, and you might need to hollow out the car model to get the right fit, but lots of folks have done it. Here are several examples of Rail Cars, Rail Trucks, and Rail Busses that have been commercially available in On30 or Large Scale in recent years. Many rail cars and speeders made for HO can easily be adapted for On30, by replacing parts of the shell with pieces from On30 equipment (or even O gauge equipment). Commercial products currently available include the Bachmann Rail Trucks and Rail busses. Rail Trucks - Bachmann makes several On30 rail trucks based on one originally built by the Rio Grand Southern, including one that is labeled for the Little River Rail Road. Note: All of these products have DCC installed This is a feature that allows you to control more than one train on the same track, if you also purchase the Bachmann DCC Controller . If you don't have a DCC controller, they work like regular DC-powered trains. Two of the Bachmann On30 rail trucks are shown below, with links to Amazon dealers. In addition to the Little River and Unpainted Rail Trucks shown below, Bachmann also makes rail trucks painted for US Mail and Colorado Mining . To see more Bachmann On30 rail trucks, please visit the BigTrainStore(tm)'s On30 Self-Propelled Vehicle page. Rail Busses - Bachmann has also introduced a line of rail buses that would look at home on almost any narrow gauge railroad. Note: All of these products have DCC installed, for more convenient remote control on indoor railroads. Two of the Bachmann On30 rail busses are shown below, with links to Amazon dealers. In addition to the Little River Logging Company and Unlettered Rail Bus and Trailer combinations shown below, Bachmann also makes combinations labeled for Midwest Quarry , Pocohontas Lumber Company , Greenbriar and Big Run , and Colorado Mining . To see more Bachmann On30 rail busses, please visit the BigTrainStore(tm)'s On30 Self-Propelled Vehicle page. In Large Scale, it is relatively easy to get a power truck from AristoCraft or some other source, and find a model car that you can adapt to fit it. In fact, a couple of years ago, a fellow was selling a bunch of rail cars on eBay that he had built in his basement. Making a commercial product is a little more complicated, but a wide range of Large Scale rail cars, rail busses, rail trucks, and speeders have been manufactured over the years, some in very small quantities. Only a few are commercially available today, but we'll mention several that you can still get your hands on easily enough. So, unlike the On30 list above, here are a few suggestions that I don't have vendor links for, but you can probably track down if you look hard enough. Delton/HLW Doozie - This classic of modern garden railroading was first manufactured by Delton Locomotive works, a company that pioneered several fine 1:24 models in the early days of modern garden railroading. The "Delton Doozie" put a Mac Truck hood on the front of one of its "shorty" combine cars and a power truck underneath. Though this wasn't a model of any specific rail bus, it was close enough in principle to be picked up by many Narrow Gauge garden railroaders, especially folks modeling RGS. 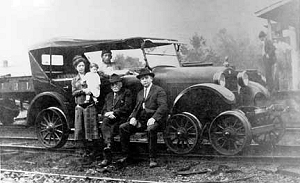 When Delton went out of business, many of the molds went to the Hartland Locomotive Works company, including the molds for the Mac truck hood and the shorty combine. They have revived the Delton Doozie in something very close to its original form. HLW is a small, US-owned, US-manufactured line that doesn't always have the resources or storage space it needs, so they have to produce products in smaller batches than their competitors. At the moment, HLW Doozies are available in many stores, but stocks can run low before the next batch is built. The photo to the right shows an HLW Doozie decorated like a Rio Grand Southern railbus, commonly called a "Goose," although it's not a model of a specific RGS railbus. Aristo also made a limited edition brass rail bus. It's a model of a bus that White built for a small railroad in New Jersey. The model got pretty good reviews, and is mechanically very solid, but is not currently in the AristoCraft catalog. Galloping Geese Several companies, including AMS have produced high-end models of specific, well-known Rio Grande Southern rail trucks that were dubbed the "Galloping Geese." I believe AristoCraft has also made a "short run" of similar models Again, these are made in batches, so availability comes and goes. Some "Geese" are available with realistic sound cards installed. The following illustrations represent AMS/Accucraft "Geese" that have been available in the last several years. HLW Rail Cars The HLW Rail Car uses a Mac Truck front end on a powered frame, with a custom-designed passenger compartment. These are commercially available now in several colors. If you click on the photo to the right, you should see the HLW page that describes these products, which would be very much at home on the Little River Railroad and Lumber Company's trackage, or most other 1910-1940s railroads. 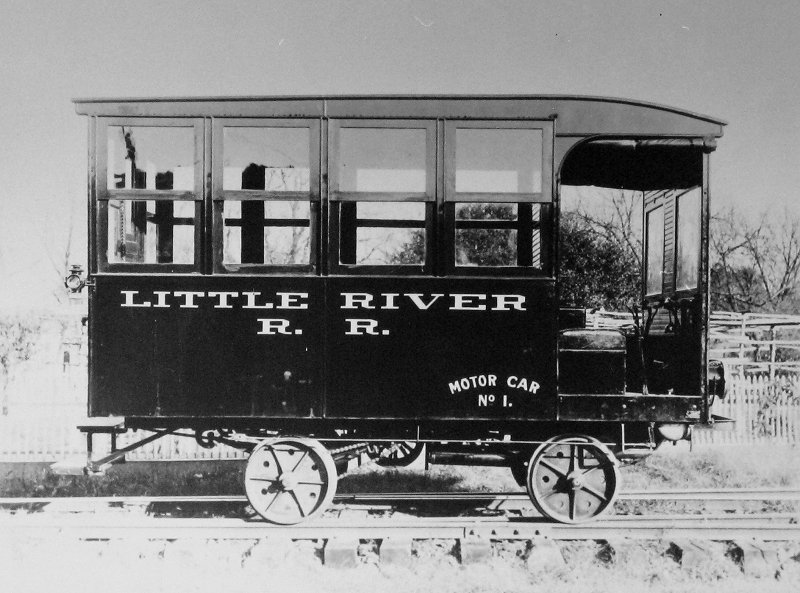 HLW Rail Motor Car (RMC) - HLW has also made a Rail Motor Car that would be at home on interurban lines (lines that went between cities to connect streetcar networks). 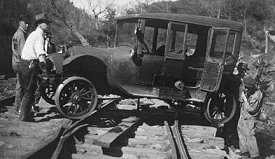 But cars similar to this one were used on many short lines when falling traffic made running a steam train unprofitable on certain routes. In railroading terms, a "speeder" is a small 4-wheeled platform with a gasoline- or diesel-powered engine (not diesel-electric) that you can use to inspect the track or run errands, as long as the big trains aren't headed your way. Some speeders include windshields and passenger compartments of a sort. This model, by now-defunct toy train company, is unusual in that it was sold to O gaugers and Large Scalers alike. USA trains now has a speeder that, by the strangest coincidence, looks just like the defunct K-Line speeder. They are marketing it as Large Scale. Some folks say it's the same model with a DC motor and the wheels adjusted for 45mm, but I can't believe that a respected company would attempt such a short cut. It is too small to look right with Large Scale narrow gauge equipment like the Bachmann Shay. That said, it is the least expensive model on this page, so if you see one and you like it, go for it. Or get a power truck directly from AristoCraft's parts department and "roll your own." In the meantime, contact us with any questions, concerns, corrections, or examples of things you've done on your own railroad. 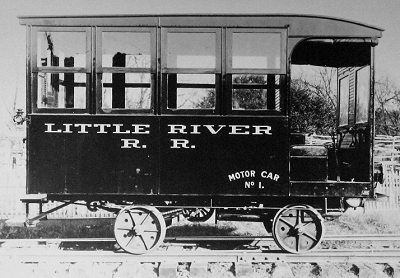 Return to the Little River Railroad index page.